Yesterday, Doug and I operated on Jane for the third time in 4 years to remove multiple parathyroid tumor "implants" within her neck. Her story started in 1999, 14 years ago when a surgeon in her home town of Charlotte, North Carolina operated on her to remove a parathyroid adenoma on the right side of her neck. The tumor was removed in multiple pieces because the surgeon broke it into pieces before he had it removed from her neck. She appeared to be cured of hyperparathyroidism for about 3 years (with normal calcium and PTH levels). But about 2003 her calcium and PTH levels became elevated and she once again had severe hyperparathyroidism. Her scans showed several tumor spots on the right side of the neck, but the surgeon did not understand the problem. He thought that she developed two NEW parathyroid adenomas (Look folks, nobody gets hyperparathyroidism twice if the operation is done correctly the first time-and all four parathyroid glands are examined-and the tumor is completely removed-and the tumor is not broken. And, how could he be thinking she had TWO new parathyroid tumors on the right side of her neck-since he already removed one and we only have two on each side of the neck to begin with?). So he operated on her to find her two "new" parathyroid adenomas (no such thing!). Of course he couldn't find them (because he was looking around the thyroid for real parathyroid glands-and these are not real parathyroid glands, they are parathyroid tumors growing in the muscle and fat of the neck-right where the cells were dropped). Since he couldn't find the "new" parathyroid adenomas, he removed her entire thyroid (a mistake), and the two normal parathyroid glands he could find. She was not the slightest bit better and when they scanned her a month post-op they saw the same two tumor spots. Finally her endocrinologist sent her to our center in Tampa so she could see somebody that knew what was going on. Why to doctors take so long to ask for help? Really, it took three years to call us to help? UGH! The first time we met Jane in 2008 she had calcium levels about 13.5 mg/dl and PTH levels around 350 pg/ml (very high!). She had severe osteoporosis and had 4 kidney stones in the past 2 years. Her kidney function was deteriorating. 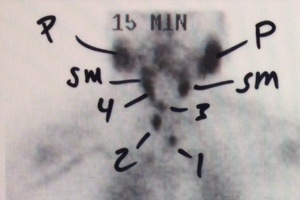 The first sestamibi scan on the left shows the hot spots corresponding to the parathyroid tumor implants. The numbers 1-4 show the four large implants in her neck. The "P"s are her parotid salivary gland (this is normal), and the SM are her submandibular salivary glands (this is normal too-all sestamibi scans show the salivary glands in all people-normally). Her thyroid is missing from her neck (Mr Potato Head removed it looking for more parathyroid "adenomas", not recognizing the problem at hand). This photo shows the multiple parathyroid tumor implants that we removed from Jane that day. These are numbered 1 through 4 and arranged in the photo like they are on the sestamibi scan. Note that we found 2 more implants that didn't even show on her sestamibi scan (labeled "extra"). Note how these tumors are irregular shaped with rough edges-classic for tumor implants. Compare these to photos of typical parathyroid adenomas on parathyroid.com that have beautiful smooth edges. Parathyroid tumor cells will grow anywhere. These are not cancerous cells, but if you drop a piece of the parathyroid tumor into the neck during an operation then these cells will start growing. Every one of these tumor masses (in the photo) grew in Jane's neck where pieces of parathyroid adenoma were dropped during her first operation to remove the tumor. It is absolutely imperative that the surgeon not break the parathyroid tumor while he/she is removing it. This is why you want an expert parathyroid surgeon-when things go bad during parathyroid surgery, they can go terribly bad. Each one of these parathyroid tumors makes huge amounts of parathyroid hormone (PTH) giving the patient severe primary hyperparathyroidism. Jane did great after her first operation with us (the pictures above). Her PTH of 358 pg/ml decreased to 24 and her calcium went down to 9.4 mg/dl. However, within 4 months her calcium was above 10.0 mg/dl (adults are not supposed to have calcium levels above 10.0 mg/dl). We followed her for another 18 months but then brought her back for her second operation. Remember, this is what happens to these folks-they are very hard to cure. NEW parathyroid tumor implants keep showing up for years and years. These people typically need operations every 2 years or so to remove the new tumor implants. As noted above, we have 11 of these patients in our practice from all over the world that come back to our Parathyroid Center every 2 years or so to have their latest tumor implants removed. We will forever be picking "weeds" out of their neck. Jane's third parathyroid tumor implant operation with us occurred today. Her sestamibi scan showed 3 different parathyroid tumor implants that were too small to be detectable previously. We removed these three along with two more that didn't show on the scan. When she left today her parathyroid hormone (PTH) had decreased from 188 to 9.2 pg/ml. She is happy as can be, but she knows this is going to happen again because more weeds are going to grow. We're here for Jane and will be taking care of her for many years to come. Beware of the surgeon who takes a parathyroid tumor out in pieces. Bad things are virtually guaranteed to happen! Sestamibi showing several parathyroid implants from broken parathyroid adenoma. Meet Connie, a 52 year old operating room nurse from Dallas, Texas. She too had a local surgeon operate on her (he was the surgeon that "did the parathyroid operations at her hospital", about 10-12 per year) (we do 10-12 per day). She too was cured of hyperparathyroidism for about 2 years, then the parathyroid disease came back worse than before. Remember that "nobody gets hyperparathyroidism twice". If they do, then almost 100% of the time something went wrong during the first operation-or the surgeon just removed the one tumor that showed on the scan and did not examine the other three glands (this is cheating, do not do this!). Connie's endocrinologist in Dallas recognized that something bad was happening and she sent Connie to see us. The first picture on the left is her sestamibi scan. You can see the submandibular (below the jaw) salivary glands like we all have, and you can see the "butterfly" thyroid gland (nobody has removed Connie's thyroid gland (thankfully!). 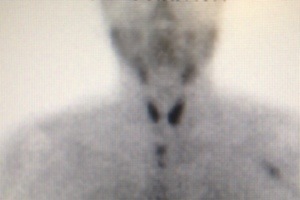 Below the thyroid in the lower neck and upper chest are two large parathyroid implants. 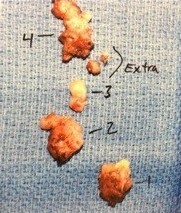 The photo to the left shows the parathyroid tumor implants that we removed from Connie's neck. Once again we can see how the sestamibi scan underestimates the size and number of the parathyroid tumor implants. The scan shows two, and we found four. 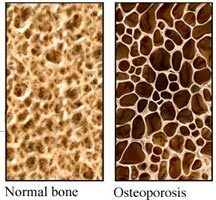 Another thing that I want you to learn from this blog is that sestamibi scans can be helpful, but more often than not, they are wrong. In ALL cases of parathyroid tumor implants from a broken parathyroid tumor, all scans will underestimate the number and size of the implants. This is the same for people about to undergo their FIRST parathyroid operation-a sestamibi scan that shows a tumor will almost never show a second smaller tumor if one is present (25-30% of the time). This is why a surgeon must look at all the parathyroid glands during the first operation. Sestamibi scans ALWAYS underestimate the number of bad parathyroid glands. If you have not watched the movie of me performing a four-gland mini-parathyroid operation in less than 13 minutes, you need to do so. In that operation I remove two parathyroid tumors even though a very good quality sestamibi scan showed only one parathyroid adenoma. Sestamibi scans are not nearly as accurate as you are lead to believe. This is why I am always preaching to stop worrying about the scans. Scans are wrong more than they are right. Scans are just a tool, and often not a very good tool. Stop getting scans folks… get an expert surgeon and stop worrying about scans! Let's get back to Connie… She went home with a parathyroid hormone (PTH) level of 11.3 pg/ml (down from 288 pre-op) and a calcium level of 9.4 mg/dl (down from 12.4 pre-op). She felt better within 30 minutes of the operation (this happens very frequently-she had terrible bone pain that almost always is gone within 30-60 minutes). We told Connie to expect that new parathyroid tumor implants will show up again in 2-3 years, and then 2-3 years after that, and again and again. This is what happens when your surgeon breaks your parathyroid tumor when he is taking it out. The parathyroid cells can grow wherever they are dropped-on a muscle, on some fat, even on the surface of the thyroid gland or carotid artery. Another important note about how we perform parathyroid surgery at our Center is that we provide our patients with a photo of the tumor. There are MANY reasons why we give a patient a photo, but one of them is so everybody can see the tumor is in one piece, is not broken, and it has been taken out by the root. Our patients don't have to worry about parathyroid tumor implants in their necks-we learn these valuable lessons from the thousands of "bad" cases that are sent to us every year. Broken parathyroid tumors in the chest. A terrible problem that can't be fixed. The last example of a broken parathyroid tumor that I want to discuss is Elizabeth. She is 72 years old and has had 12 (twelve!) operations for primary hyperparathyroidism-the last 6 by us here in Tampa. Liz is dying of severe primary hyperparathyroidism that cannot be cured. Liz had a very simple problem-a small parathyroid tumor in the chest. Please see my blog on parathyroid tumors in the chest, but as a reminder, at least 95% of parathyroid adenomas located in the chest can be removed from a small neck incision. Liz had a small parathyroid tumor (about the size of an almond) located behind her sternum (breast bone). Her endocrinologist and general surgeon don't realize that these can almost always be removed from a small neck incision, so they consulted with a chest surgeon. They decided to remove the parathyroid tumor using a scope (thoracoscopic approach). This was the bad decision that ruined her life. There are no good tools for removing tumors through a scope, so they use what they have… some "grabbers" to remove the tumor one small piece at a time. Yep, they purposefully broke the tumor so they could get it out through the scope (remember, they thought they were doing her a favor by not splitting her sternum like open heart surgery). Within 6 months Liz's calcium and PTH were high again. Within 2 years her calcium was above 13 mg/dl and she had her first re-operation. This time they were forced to open her chest down the middle (split the sternum like open heart surgery). They cleaned out 9 parathyroid tumor implants that they could find. After the operation her calcium was still 11.4 mg/dl and her PTH was still above 200 pg/ml. Her second operation included the resection of 3 ribs and part of her chest wall. The chest wall was reconstructed using a plastic mesh. Her third operation was to remove a rib on the other side of her chest. Her fourth operation removed a small piece of the upper part of her left lung. Eventually she was sent to us and we have operated on her another 6 times, every one aimed at a new "spot" that shows on her scan. We have removed part of her diaphragm and some more chest wall. Her calcium levels are over 13, her PTH is over 450 and she is going to die of this disease soon. She could have been cured initially via a 15-20 minute operation had she come to our center. Instead, she has had very few "good" days and has spent months in hospital beds following a dozen operations on her chest. You think these horror stories are rare? Nope, we see this sort of stuff almost every day. We have a total of three patients who have multiple parathyroid tumor implants in their chest because the surgeon thought he was doing a good thing by trying to remove it with a scope. We consult on people from all over the world every week who have parathyroid tumor implants because their surgeon was not experienced enough in dealing with these typically very soft tumors that can easily be broken if they are not handled correctly. Please folks, pick your parathyroid surgeon wisely. When these operations go bad, they go very, very bad. See photos of parathyroid tumors. Read the blog on parathyroid tumors in the chest. Watch the movie showing a mini (less than 1 inch) parathyroid operation where we examine all four parathyroid glands, measure the amount of hormone each gland is making, remove two parathyroid adenomas (when the sestamibi scan showed only 1), and close the wound using plastic surgery techniques-all in under 13 minutes.